The living doll Karolina is a seamstress. She sews wishes into the doll’s clothes she makes in her Kingdom known as the Land of the Dolls. An invasion by rats that have threatened their Kingdom for years, forces her to set out for the human world, where along the way, she meets Fritz, a toy soldier. 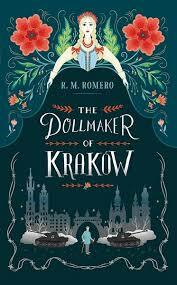 Karolina awakes to find herself without Fritz, and in a Dollmaker’s shop in Krakow, Poland, in 1939, after being carried there by the wind, Dogoda. Her cracked cheek and tattered clothes have been restored to their initial beautiful state. Karolina carries magic with her. This secret magic is a powerful tool which she uses to transform and save lives, in a country invaded by the enemy, where children shipped to promised lands on trains, never return. Her gift later becomes a weapon against her. The Dollmaker, a broken man, is also gifted with a magic that has been dormant for years. His solitary and withdrawn life, have left him badly scarred. With Karolina’s coming, his darkness slowly evaporates. He is restored through love, and so is his gift. Their lives entwine in an inexplicable way. They face many challenges and a tragic loss due to war, but regain hope and a togetherness they both thought was gone forever. The stories are aligned perfectly. The invasion of the Kingdom of the dolls by the rats, how they finalize their plans, then exert their power over the country, is a strong reference to what happened to the children and others at the hands of the enemy during the Holocaust. The book is beautifully presented. It’s an anthem to voices that are never silenced as long as there are stories to be told. A stunning cover portrays the most significant images from the narrative. The pages are decorated with black ink borders. The chapters depicting Karolina’s life before her transportation to the human world are decorated in dolls. The parts of her story after she leaves her Kingdom are bordered in rats. Perfect prose propels the story. Charming words of wisdom pour from the characters voices. Sadness is transformed into hope. Love regenerates the damaged souls. This is a book that will stay with you long after the cover closes.